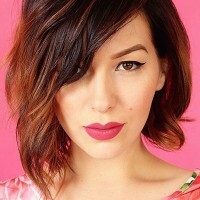 Many of our glorious hairstyle galleries on Styles Weekly are aimed at women, and we thought it was about time we catered to our younger audience and gathered a gallery of stunning hairstyles which are just perfect for teenage girls. Here are some of our favourite braided hair looks for teenage girls, we’d love to know which ones you prefer and what you’d like to see next! This young lady has the most gorgeous head of natural curls, and hair which falls down her back several inches below the shoulder. 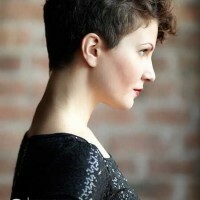 Her hair is a gorgeous shade of rich brown, finished with a slightly lighter colour on the very ends. 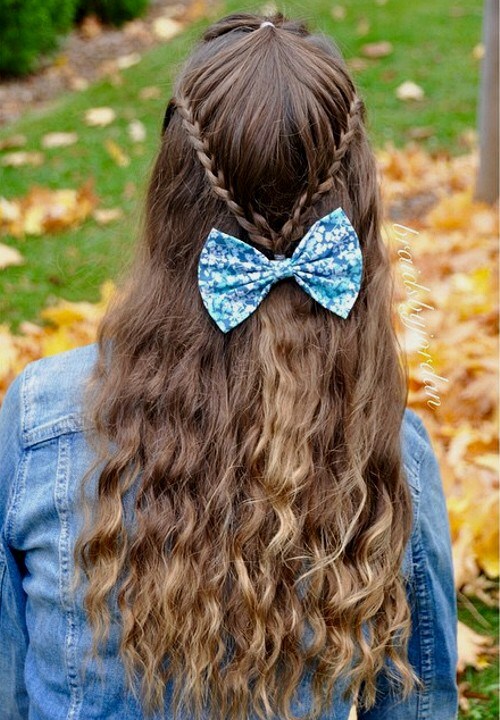 She’s worked two thin braids from the front of the head towards the back, one one either side of the head, and met them in the middle, finishing with this lovely blue bow. 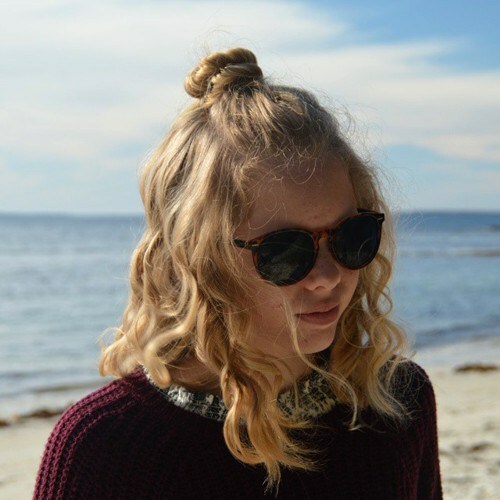 This absolutely stunning blonde bun has well and truly stolen the hearts of the Styles Weekly office – acting as the perfect hairstyle for those seeking something classy and stylish for a special occasion! 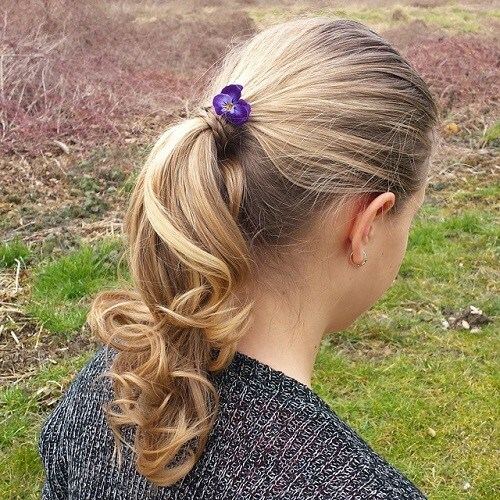 This young girl has worked her beautiful blonde hair into a side bun, using a unique knotted technique to sweep the hair up with a truly gorgeous finish. A French braid is an absolutely classic up do, and one look at this utterly gorgeous hairstyle is the proof in itself. 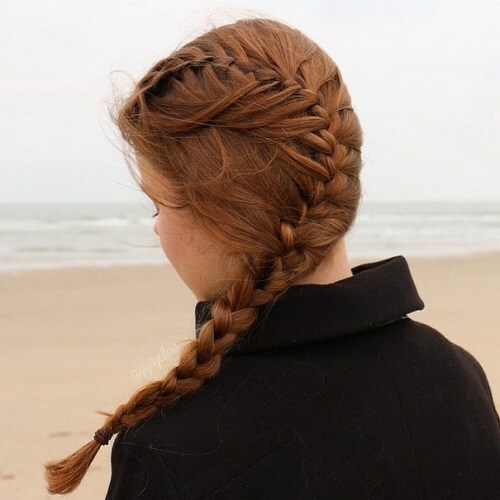 This lovely girl has long copper hair in the most stunning shade we ever did see, and she’s gathered her hair into a french braid which runs from the front of the head, gathering all of the hair together, right to the back of the head. We absolutely love this stunning up do! This look would be just perfect for a formal event or special occasion. The hair starts a deep and dark brown, which blends into a gorgeous shade of blonde through an ombre transition. She’s created two elaborate braids from the front of the head and fastened them into this gorgeous twised bun at the back of the head. 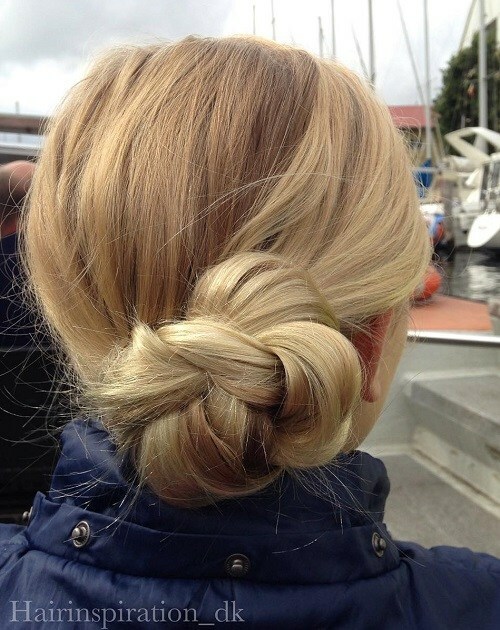 We love this braided up do – it’s the perfect low maintenance style which looks incredibly pretty too! 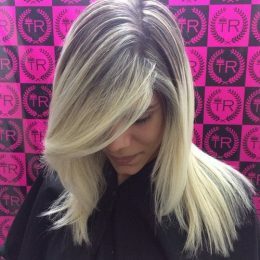 The roots of the hair are a deep and dark brown and it blends subtly into a gorgeous lighter blonde shade. Each side of the hair have been worked into chunky braids, gathering to a lovely ponytail which cascades down the back in style. 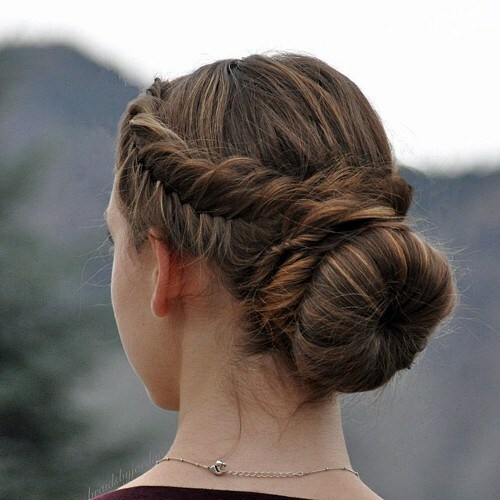 Another braided up do which is oh so pretty – we just adore this side bun look! This lovely girl has worked her blonde hair into two french braids from one side of the heaad to the other side, creating this incredible double braided finish. The hair blends into a gorgeous side bun which keeps all the hair together absolutely perfectly. This style is utterly effortless yet so stylish at the very same time – a real winner from us! 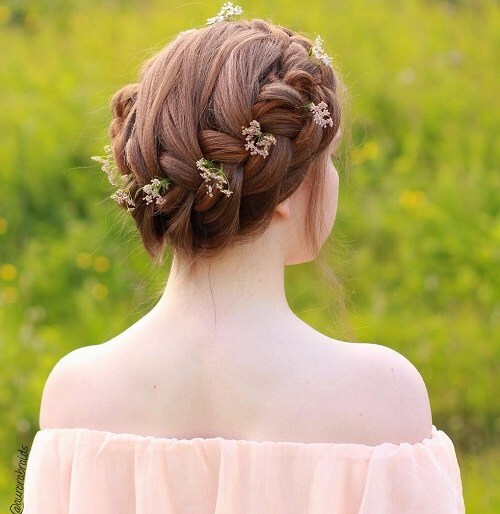 This gorgeous hair is a rich shade of chocolate brown, and the hair has been worked into a chunky French braid from the top of the head to around the ear length. The rest of the hair has been worked into this quirky and fashionable messy bun which we just adore. This adorable little lady has created an incredibly fashionable hairstyle which we simply cannot get enough of! Her hair has a deep side parting and the rest of her brown hair falls a few inches below the shoulders, the front section falling perfectly in a sweeping style. She’s worked the opposite side of the hair into three braids from front to back. This gorgeous lady has hair which starts a chocolate brown and blends quickly into a beautiful copper shade through an ombre transition. The hair is left straight and sleek, but the front section on one side of the head worked into tight and thin braids from front to back in a cool and contemporary finish which we literally cannot get enough of! This look is totally dramatic and oh so striking, we absolutely adore it! 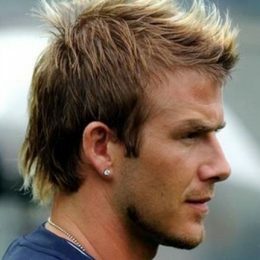 The perfect statement hairstyle for those who wish to attract attention for all the right reasons. This young girl has a gorgeous light brown colour to her hair, which has been lightly tousled to perfection. A cool and unique braid is worked from one side of the head to the other, the sections are pulled loosely to create this fabulous finish. This hairstyle is sleek, stylish and oh so fashionable – three things which we adore when it comes to an up do! 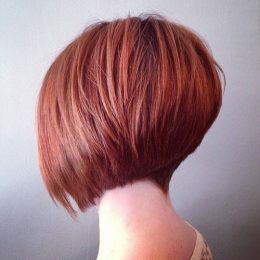 Her hair is a deep and dark brown, finished with gorgeous copper flecks throughout which creates this incredible finish. She’s worked two fishtail braids on either side of the head, meeting in the middle and twisting to create this gorgeous bun. 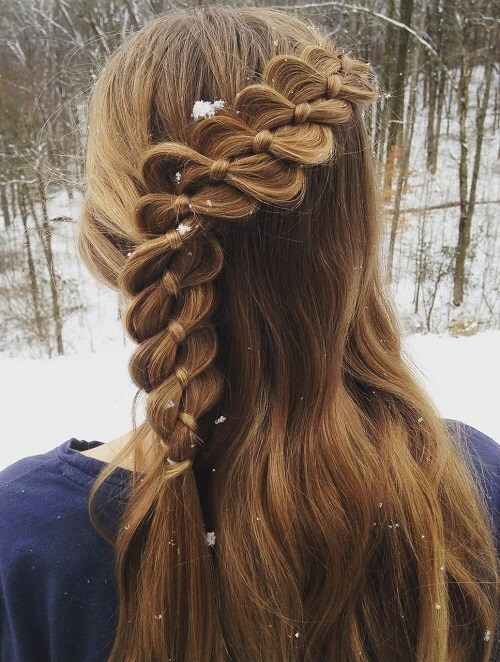 This gorgeous girl has the most beautiful blonde locks we ever did see – which is why we love that she’s chosen to show them off with this unique braided crown we adore. She’s worked the fringe section of hair into two chunky braids from one side of the head to the other creating this adorable halo effect. It looks amazing – don’t you think? This striking lady has the most beautiful features – which is exactly whys he’s chosen to show them off thanks to this beautiful hairstyle she’s worked for. Her deep, dark and glossy brown hair has been worked into two plaits – one on either side of the head. 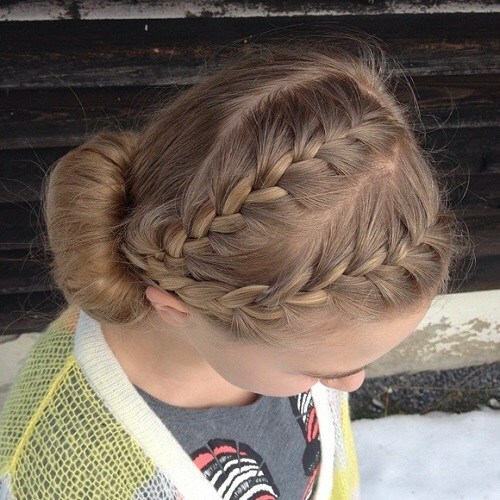 She’s wrapped the plaits around on the top into this gorgeous milkmaid braid style. 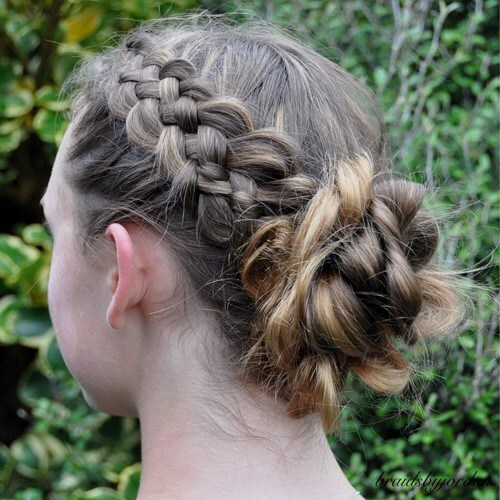 This is a gorgeous and bohemian braided style which has the Styles Weekly office swooning! 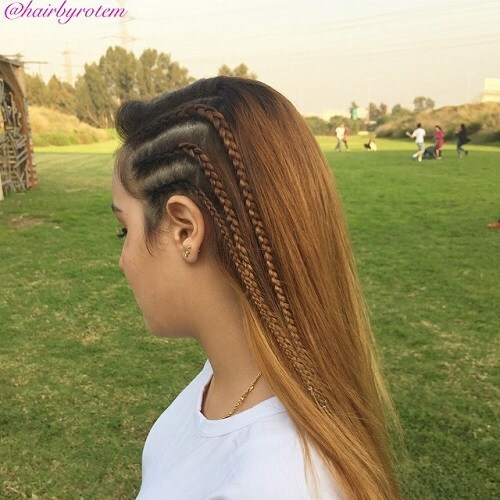 This beautifl blonde and curly hair has been worked into this impeccable loose braided style. 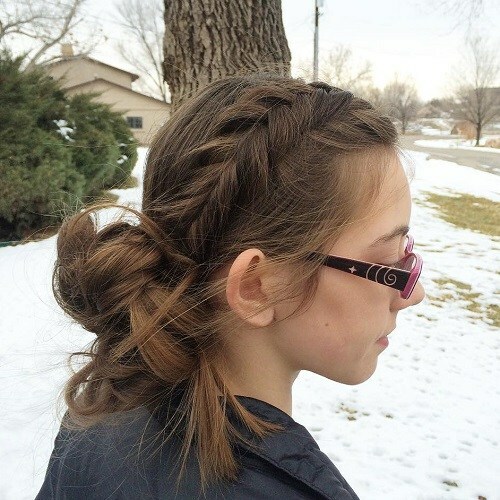 Sweeping the hair back into this incredible french braid, this girl has finished off the look with a stunning flower crown adding a light and fun finish to this style. This young girl’s gorgeous hair works from a chocolate brown into a golden blonde through a striking ombre transition which we simply cannot get enough of. To show off the amazing colour blend, she’s created a range of different width braids and weaved them together for this elaborate and dramatic end result which is oh so stunning. An ordinary ponytail look has been transformed into the most gorgeous and stylish end result which we cannot get enough of! A traditional ponytail has been transformed, thanks to a sneaky braid which works its way from the front to the back of the head and adds life to this amazing ponytail. She’s wrapped a section of hair around the ponytail to create the remarkable finish that we’re seeing in this picture! This lucky lady is blessed with the most gorgeous, long and glossy hair we ever did see! Her hair is a stunning shade of caramel blonde full of bright blonde highlights throughout. 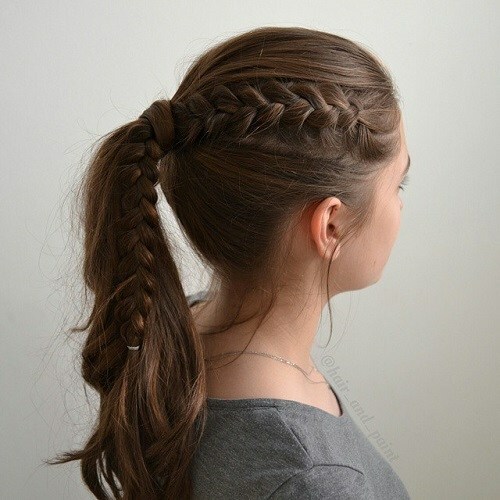 She’s gathered one side of the hair towards the front of the head and created this simply yet stunning staggered braid which falls in the centre of the head at the back. This utterly beautiful and chunky braided up do is oh so striking – absolutely perfect for a wedding or for a special occasion! This copper shade is glossy and gorgeous, worked into a huge chunky halo braid which encompasses the whole head. 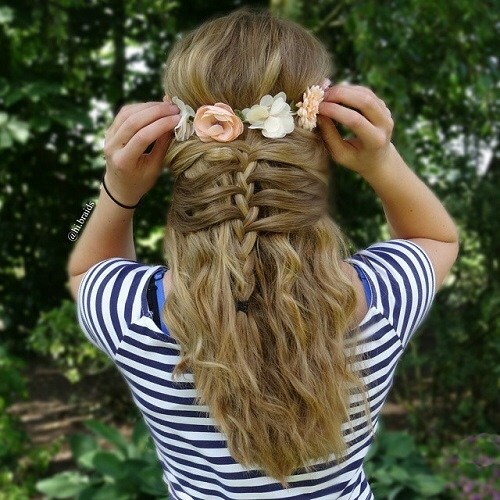 She’s added subtle flowers throughout the braid to add a bohemian and fancy finish which we adore. This lady has gorgeous hair which is full of a collection of golden shades! Starting with a lovely light blonde and blending quickly into a golden blonde shade, this lady has created a truly elaborate fishtail braid to show off the blend of colours together. 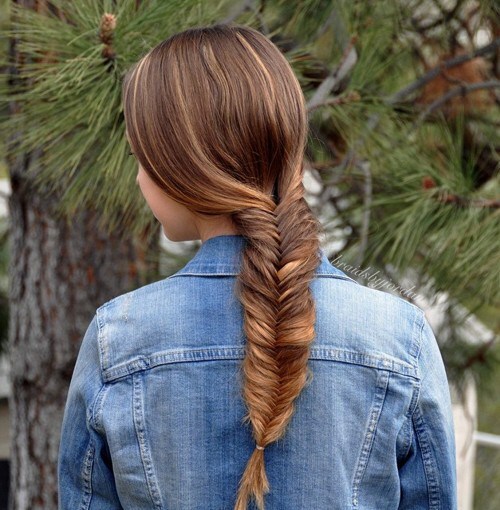 This chunky fishtail braid is simply stunning, keeps the hair off the face and is super fashionable too! This might just be our favourite hairstyle of this gorgeous collection – we simply cannot stop staring at the perfect finish result. The roots of the hair are a deep and glossy shade of mahogany red, which blend quickly into a caramel shade of blonde. She’s loosely swept her locks into a chunky braid from top to bottom at the back, and left the front sections fall loosely around her face. This hairstyle looks every bit as effortless as this gorgeous and cool girl who is rocking it! Her beautiful blonde hair is full of curls from top to bottom, which she’s left hang naturally for the majority of the hair. 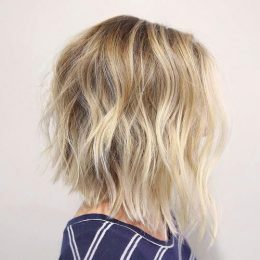 The top section has been swept back from the front of the head to the back, and finished with a tight and knotted bun to create the ultimate smart casual finishing touch. 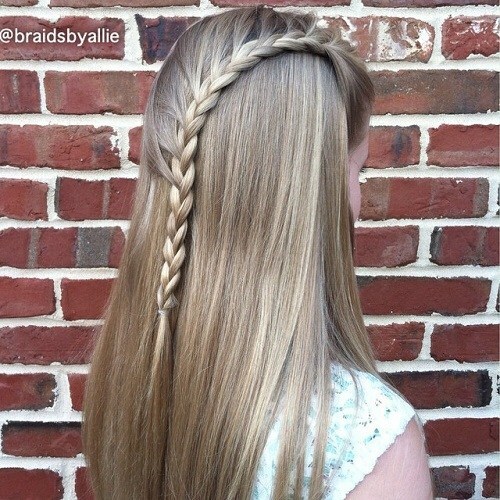 All of these gorgeous braided and up styles are simply perfect for teenage girls – and most are easy to recreate but with a stunning finished result. We’d love to know which of these looks are your favourites. And here is a simple daily hair for medium length hair. This lovely lady has showed us the perfect way to perk up a ponytail and turn a simple style into something oh so wonderful. Her blonde hair has been worked into a low ponytail, which has been wrapped with a thin braid to conceal the hair band. She’s added ringlets throughout the ponytail section which fall down her back perfectly.